Amplify your communication skills with the Visual Dictionary & Thesaurus iPhone, iPod Touch, and iPad app. It is a vital resource to professionals and students who want to enhance their written and verbal presentations. The sharp, gesture-controlled interface is simple, yet stimulating, but the thorough, enriching content is fantastic. The Visual Dictionary & Thesaurus iPhone app is worth every penny of the $1.99 download from the iTunes App Store. 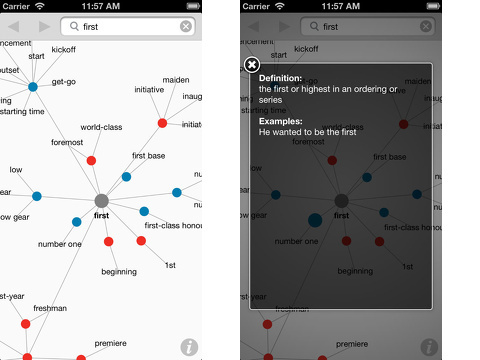 The Visual Dictionary & Thesaurus iPhone app not only brings you definitions and words of similar meaning, but the visual picture links together the varying contexts and connections for words. When you open it, the word “first” is linked with lines to words of similar meaning. There is a colored dot on each line to indicate the part of speech – blue for nouns, red for adjectives, green for verbs, and purple for adverbs. When you tap on the dot, a pop-up gives you the definition and examples. For each group of words that share a context and definition, they are grouped together. A group of words literally forms a flower around one line, and for some words, there are multiple flowers to show words’ relationships. Tap on a word, and the screen instantly changes to that word’s visual connections. You use a back and forward icon in the top of the screen to move between your words. You enter new words in the search bar in the upper left corner. As a writer and mother, I am struck by this smart, innovative approach to meaning and context in our language. I explored the word “argument,” and its visual connections show the depth of this app’s content. The word argument had two larger groups of words, three smaller groups, and two single word connections. One large group related to the act of arguing and controversy, and the other related to logic. The smaller groups related to mathematics, debate, and computer science. Finally, the single words were “literary argument” and “statement.” This perspective to one word is insightful and thought-provoking. It is also a tool to use with precocious children, as their capacity for vocabulary increases. It is a great tool to combat writer’s block when your kids are writing papers. The Visual Dictionary & Thesaurus iPhone, iPod Touch, and iPad app demonstrates beautifully the transition of a vital reference tool into a digital interface that reflects how we live and learn now. AppSafari review of Visual Dictionary & Thesaurus was written by Jenni Ward on February 11th, 2014 and categorized under App Store, Education, Enterprise, iPad apps, Kids, Productivity, Reference, Universal. Page viewed 5689 times, 1 so far today. Need help on using these apps? Please read the Help Page. These application updates are great, always make life easier on us. A very small value for the utility. I think it’s worth.